Disclaimer: What follows is not intended as a polemic against the vegan movement. Not that it’s any of my business what other people choose to eat and why, but it seems to me that at least two of the most common reasons cited for becoming vegetarian or vegan – not abiding by the suffering of sentient creatures, and supporting more sustainable ways to produce food for everyone – are compelling and worthy of anyone’s consideration, including mine. What I want to comment on here are some narrow and specific rhetorical strands in the arguments in favour of ‘virtuous’ diets and lifestyles, and how they fit within contemporary ideology and the discourse about mortality. Regular readers of this blog will be broadly aware of where I’m coming from; others, I hope, won’t take offence where none is meant. When I asked Joe what made him decide to change, he responded very simply. “We believed you”. Dr. Caldwell Esselstyn thinks he knows the cause of heart disease, and how to cure it. He might know how to prevent several of the most common types of cancer, too. It’s all in the diet. Renounce meat, eggs and dairy. Say goodbye to nuts and oils. Eat to live. His contention, simply put, is that all the foods just mentioned injure the endothelial cells and impair their ability to produce nitric oxide, a compound whose several regulatory effects are fundamental for the prevention of heart disease. While the basis for this hypothesis is epidemiological – based on observations of populations in certain times and places who ate almost solely plant-based foods and lived free of heart disease – the effects on the endothelium of different foods can be readily observed by means of the brachial artery tourniquet test (or BART), informing the dietary prescriptions I just outlined. Besides oil, nuts and avocados, animal products are forbidden then not on ethical grounds but because of their harmful effects, which can be measured literally as they pass our lips. I am not equipped to evaluate any of these expert claims. I might note with a degree of suspicion that the praise for Esselstyn’s book comes mostly from authors of other books of very similar bent, such as T. Colin Campbell’s The China Study, Dean Ornish’s Dr Dean Ornish’s Program for Reversing Heart Disease, Oz and Roizen’s You: The Owner’s Manual and others. I might also note that the BART test is mentioned on the Net almost exclusively in discussions regarding these books. Mindful of the methodological criticism for The China Study, I might suspend my judgment until Esselstyn’s Prevent and Reverse Heart Disease is subject to the same scrutiny, or the results of his research begin to be replicated elsewhere and on a greater number of patients. That being said, some aspects of the prescription fit in with what we know about the lower incidence of heart disease amongst people who eat primarily or exclusively plant-based foods, so it’s not a question for the lay person of having to take it entirely on faith. Yet faith comes into it precisely because of the language in which the diet is presented and marketed, employing rhetoric that we are accustomed to hear from our spiritual leaders. Let’s start with the title of Esselstyn’s first chapter: Eating to live. To live longer and free of disease is a reasonable aspiration and we may wish to judge the contribution of medicine to society according to whether it can deliver on this front and do so equitably. By offering a dietary as opposed to a pharmacological cure, Esselstyn empowers his patients to be their own healers, which strikes us instinctively as a good thing. The move also takes power and control away from pharmaceutical companies – another highly desirable outcome. But if agency rests with us, how are we to choose the correct course of action? After all Esselstyn’s cure (the italics are his) is one amongst many; Robert Atkins, for one, had a radically different prescription. The fabulously named nutrition expert Marion Nestle has written convincingly in Food Politics about the successful efforts of various commercial interests to interfere with or complicate the advice by the US authorities on what a healthy diet should consist of. She contends that this advice hasn’t appreciably changed over the last several decades – to eat a varied diet, in moderation, and with an emphasis on plant-based foods. But you can’t sell that. For one thing, it is not new. For another, it is not sufficiently prescriptive. Esselstyn knows you need to be sterner. He blurts it right out: moderation kills. Why eat something that you know will hurt you, even in small doses? Isn’t that tantamount to taking a poison? You wouldn’t have a few cigarettes reasoning that you might develop just a small lung cancer, or take a little bit of cocaine – he said in his recent interview with Kim Hill. And if the comparison with drugs strikes you as retrograde or strident, remember that the aim is 'eating to live'. That is the endgame: to preserve yourself, to save yourself. It is not about morals, unless you chose to regard living a long and healthy life as a moral imperative. Now consider Esselstyn’s core audience: heart disease sufferers, people who are painfully aware of their shortened life expectancy. He promises them that they will live. 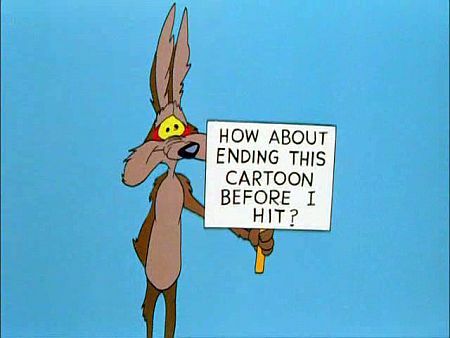 For how long? It doesn’t matter. If you had had a couple of heart attacks, wouldn’t just the prospect of eventually dying of something else seem like immortality? And it is precisely what this is, an immortality. When Esselstyn says that ‘[n]o one escapes in the end’ he doesn’t mean that you will at some point die regardless of how well you eat, but on the contrary that ‘eventually the traditional western diet guarantees some form of disease in all of us’. Our lifestyle is corrupt, and that’s what kills us. It is not time, it is not life itself. 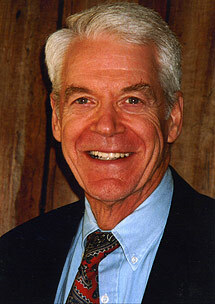 As for Esselstyn, well, Esselstyn is God: ‘I am uncompromising. I am authoritative. But as I always tell my patients, I am a caring presence.’ His objective is to ward off evil, to ‘annihilate heart disease’. And Esselstyn’s patients are the saved. All the participants in his twenty-six year study have been cured of heart disease, except for one. He tells Kim Hill that he visited this patient at his home, looked into his fridge and cupboards. Let’s just say he was disappointed by what he found there. The prescription hadn’t been followed to the letter. Yet it is very simple. It goes like this. ‘You may not eat anything with a mother or a face’. Not because it is wrong, but because it hurts you. Also: ‘You must not consume oil of any kind—not a drop’. These are god-like commandments, regular thou-shalt-nots – except the Bible for one is in fact more flexible, limiting dietary prohibitions for the most part to certain times of the week or the year. There is a convergence in these ways of conceptualising nutrition and the body, a yearning to make oneself morally deserving of being healthy, free from contagion. Consider again Esselstyn’s instruction not to eat things with ‘a mother or a face’: even when it is intended as a prophylactic measure, it is spoken in the cryptic language of the mystics, as if to promise a safety that is neither bodily nor moral, but rather symbolic and spiritual. Another immortality, one of the very few kinds that remain available to us; one that doesn’t require literal, conscious belief, yet informs how we relate to our bodies, to public health and to the attendant politics, amidst regular calls to exclude drinkers or the obese from public hospitals, or make provisions contingent to how well you have behaved, to whether you mended your ways and started to exercise. As I pick up in the weeks to come where I left off long ago, and resume the discussion of other contemporary approaches to immortality that are mediated by engineering and computer science, I’ll be confronted by ideas that I find in many respects more seductive than those of the healthy lifestyle movements, and I’ll have to dig deeper to summon the necessary scepticism. It might help in those moments to think of my father. After his first heart attack, Dad had to undergo regular check ups, and if this or that doctor happened to praise him for his exceptionally low cholesterol he would sometimes respond: ‘One of these days I’ll make a very healthy corpse’. I take it to mean that he wasn’t fooled, and that he didn’t expect to be saved. To eat a little better so that he could live a little longer, hopefully, yes, but nothing beyond that – he let no higher power or greater virtue creep into his secular worldview. And not everything that passed through his lips was part of the cure. The quotations from Dr. Esselstyn that are not indicated as belonging to his interview with Kim Hill on Radio New Zealand National of November 27th, 2010, come from chapter one of his book, Prevent and Reverse Heart Disease, which is excerpted here. 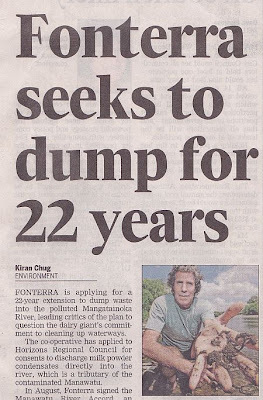 Dr. Annie Potts' survey, entitled 'Cruelty-Free Consumption in New Zealand: A National Report on the Perspectives and Experiences of Vegetarians & Other Ethical Consumers', was published by the University of Canterbury in 2007 and is availabe in PDF here. On the darker undertones of the idea that we are what we consume, I commend this brief recent post at Uninterpretative. Update: Proving himself once again a man far, far ahead of his time, Philip Challinor warned us of the danger posed by the treacherous lentil all the way back in 2005. Update 2: M. Jansen has supplied in the comments the link to a very solid-sounding critique of Esselstyn's work by Harriett Hall on the Science-Based Medicine blog. 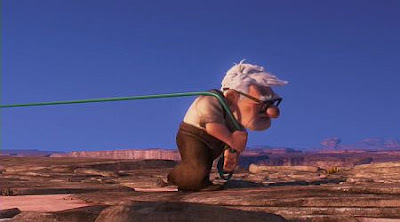 Pixar’s Up is without a doubt the best film made to date about the subprime mortgage crisis, unless you were to contend that rather than about it was in and of the crisis. 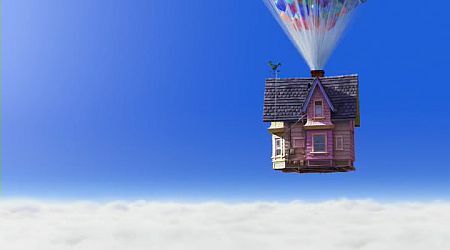 Writing began in 2004, near the peak of the housing bubble; the film was released five years later, when most Western nations were busy bleeding themselves dry to rescue what was left of their credit institutions and simultaneously doing nothing to prevent the most vulnerable borrowers from losing their homes, or else actively kicking them onto the kerb. Production took place whilst all of this unfolded, forming a perfectly rendered background of dying hopes and crumbling certainties. ‘What I am saying to you is that I have found a flaw in the model that I perceived is the critical functioning structure that defines how the world works.’ Alan Greenspan said this in October of 2008 in front of Henry Waxman and the House Committee on Oversight and Government Reform. That was the punishment for his leading role in causing the immiseration of millions of people: having to publicly concede that there may be a flaw in the model of the self-regulating free market. But spare a thought for the man, for it was no small admission: the model underpinned everything, it was the guarantor of American prosperity itself. In 2000, when Fannie Mae formulated a plan to extend home ownership to 18 million more low and middle income earning families, it chose to call it nothing less than its ‘American Dream Commitment.’ This commitment involved ‘bringing global capital to local communities,’ and global capital obliged, so long as it could place a bet on the outcome of each of those mortgages, which Greenspan dutifully allowed. What could possibly go wrong? A flying house. An old man literally tethered to his only asset. 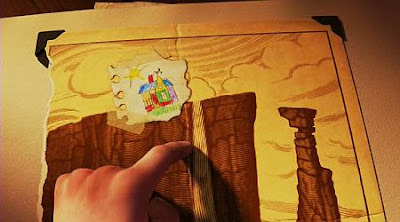 Quite another dream, that of escaping with one’s home away from civilization and the economy, and inside of a childhood drawing. There. An image, like in one of those proposals that architects and design firms put forward for no practical purpose other than enhancing their creative reputation. Say, a vertical city built under a disused viaduct. 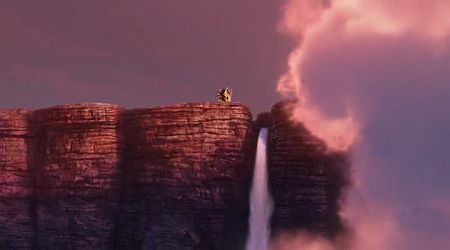 Or a lone house perched atop a cliff, next to a waterfall. 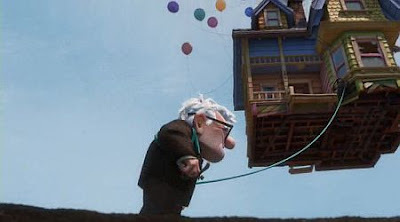 When Up shifts out of its extended prologue and into the present tense, Mr Fredricksen is about to lose his house and be moved into a retirement village. The house itself is to be demolished to make way for a massive residential building, a development that this side of the crisis seems somewhat incongruous – are the busy city centers encroaching on the quiet suburbs these days in America? My head is full of stereotyped images of abandoned peripheries and dilapidated inner cities and commercial areas reclaimed for aspiring loft dwellers rather than large scale new construction, but I make no claim to actual knowledge. 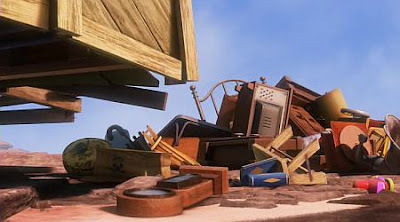 At any rate this aspect of the set up fits within the usual and supremely ironic Pixar theme of the struggle against the inexorable and dehumanizing march of progress told in the full glory of digital 3D. The face of evil here is a suited property developer who’s always talking on his cell phone despite appearing to be mouthless. 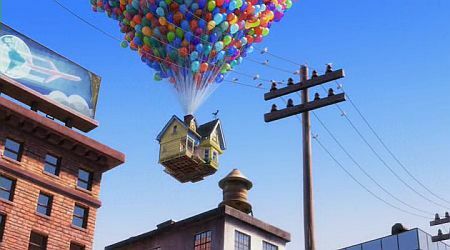 Fredericksen escapes the predicament by tying thousands of helium-filled balloons to the house, and it is clearly an escape in imagination as much as one in reality – set against the backdrop of the most catastrophic housing market collapse in history, it’s an image that demands to be deconstructed. 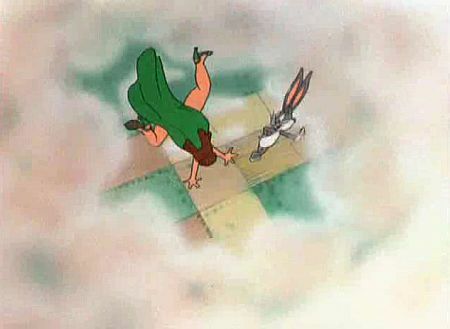 Floating gently above the clouds, away from earthly troubles. It is intriguing to speculate how the unfolding storlyine, the creeping of the word subprime into the media conversations and common parlance, the progressive deepening of the crisis might have affected at this time the screenwriters and the artists, many of whom would have had their own mortgages to service. 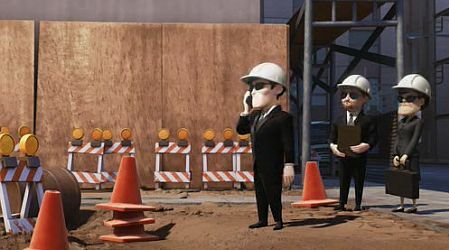 Real estate prices in Emeryville, California, where Pixar Animation Studios is headquartered, began to tumble in the spring of 2007, although not quite as severely as in some other parts of the state, which was one of the worst affected by the crisis. It is a storyline that you can also follow on the shelves of your local public library. Go to the real estate section and watch the mood swing on the book covers. In 2006, it’s upbeat books with fantastic titles along the lines of Proportunities: How to Use Creative Finance to Make a Fortune in Real Estate; by 2008, it’s the post-mortems of the bubble and the bust, and how to make the most of a bad situation. Whilst the Net has a funny way of overwriting its own past, there too with a little Google savvy you can take samples and measure the time it took for the perceptions and narratives to begin to match reality. One of my favourite documents is the Cato Institute daily podcast of 31st of August 2007, in which supply-side economist Alan Reynolds downplayed the implications of the subprime crisis for the housing market – let alone the wider economy – and placed the blame for it squarely on the borrowers themselves, whom he painted as either liars who fudged their loan applications or serial property ‘flippers’ motivated solely by greed. We know now what to make of both of those judgments, but it’s not just how comically wrong Reynolds turned out to be that makes the piece interesting; it is also his neoliberal emotional blindness to the lives of those who faced foreclosure. ‘They can just walk away’ was his somber summation. It would be nothing more than ‘an inconvenience’. Away from the struggle and the repayments, away from having to carry the house on your back, or at the end of a rope, perhaps. Away from the American dream and the injection of global capital into local communities. At its most visually lyrical, Up literally embodies this yearning. 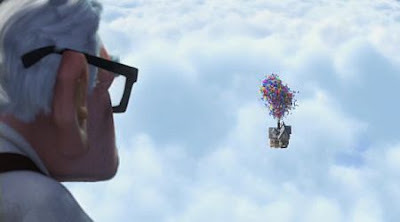 later he watches as the house itself disappears into the clouds. And when his young traveling companion commiserates him on his loss, there comes the quip that completes the arc: ‘It’s just a house’. Just a house. One of the effects of the credit crisis has been to foreclose on the aspirations of home ownership of the working class, further deferring the promise of security and prosperity for all that free market theory regards as its inevitable long-term outcome. I don’t recall in which interview or at which juncture of the crisis Jon Stewart complained rather pathetically that ‘our wealth is our work’, as if his own ideology actually allowed for such an equation. If the ongoing crisis has (re)taught us anything, it is that our work will create somebody else’s wealth. And when the crunch comes, it's the working poor and the unemployed who have to learn to let go, to rise above their attachment to material goods, as if your house was really just a house, and not also a refuge, a shelter from the uncaring outside, the anchor to your community, the thing that once paid off protects you from being evicted or foreclosed, or cushions the blow if you lose your job. In an interview for Democracy Now! on her documentary on the crisis, Lesley Cockburn spoke of how she and the other researchers had found one of the film’s main subjects, Baltimore high school teacher Denzel Mitchell, ‘inside a Goldman Sachs investment product’. She meant that they had traced the mortgage for his Baltimore home in a derivative devised and put together in Manhattan, but the choice of words is telling: it makes sense to say that they found him in there, wrapped in a financial instrument, his own little speculative bubble. Floating. 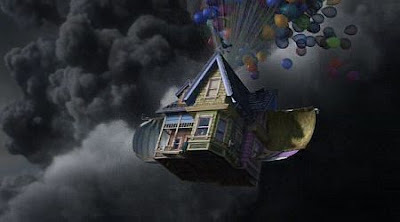 This is the destiny that Fredericksen ultimately chooses not to pursue – to float away in his house, somewhere offshore, amongst the clouds. That terse statement of fact – ‘it’s just a house’ – becomes then also a refusal to be defined by a property relation, and the means to re-enter society as a free(er) subject. It’s the other side of walking away, of letting your house be taken. In the very last image before the credits of Up start rolling we discover that the house has landed gently just where Ellie had fantasised as a child. It is a comforting resolution, inevitably so, full of symmetry and sentimental denouement, and yet at the same time unsettling, for it leaves us with the picture of a dream without its dreamer, of an economy without people. It is also therefore, in one final ambiguity, a picture of the crisis. The hat tip for the link to Matt Taibi's article in the first paragraph goes to the indispensible Zunguzungu. Friends who email us their family pictures without resizing them first: we all have them. The photos in question are generally of children, but at first when you click all you can see on the screen is the extreme close up of the top left corner of a window frame, or some floor tiles, or random foliage. Sometimes you can’t even tell what it is that you’re looking at, or if it’s the right way up. By the time you’ve finally located the critters, their terrifying grins span across half the screen. Who are these enormous children, and how can we stop them from destroying the world? 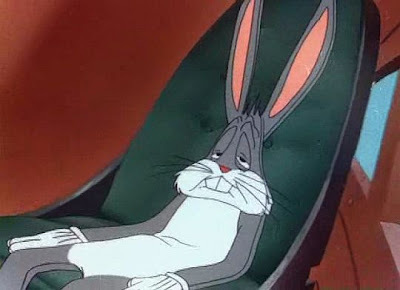 But I’m not interested today in countering that argument, at least not directly. I just want to contrast that image with another, see if thinking of digital texts in terms of their resolution might suggest another way of looking at seeing and reading, detail and meaning, what is deep and what is shallow. When you open an image that doesn’t fit your screen, most viewers – including web browsers – will generally show the top left corner of it. Do you even know at this point what you’re supposed to be looking at? Maybe not. 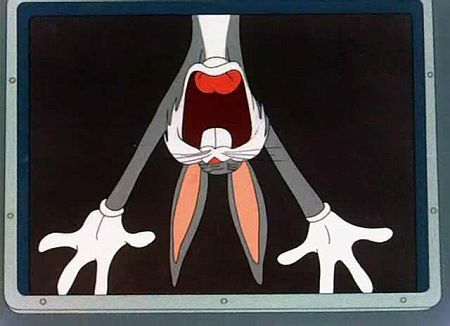 Perhaps you just clicked on a semi-random link, or have been told to ‘check this out’. So many of our encounters with texts on the Net are blind dates. In this case, it’s a date with a high resolution image. In some browsers you could instantly resize it to fit the screen, but let’s suppose that you don’t – not yet. What kind of judgments do you make about the nature of the image, at first glance? 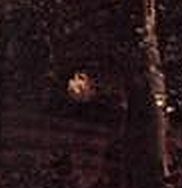 You can tell that it’s a painting, perhaps you can date it with good approximation. You may be something of an expert, and be able to recognise it right away – but again, let’s suppose you’re not. How long before you start scrolling? We’re getting towards the middle of the image. It’s a pastoral scene, by the sea, likely somewhere in Northern Europe, judging by the style. Is the sun setting or rising? If we’re in Belgium or the Netherlands, then we must be facing West towards the sea, and it’s the evening. 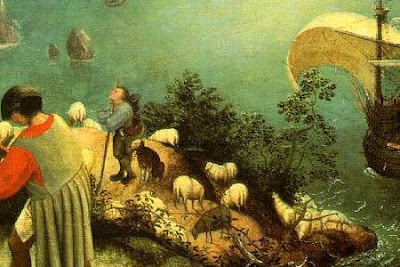 More scrolling reveals the figure in the foreground to be a ploughman, patiently toiling even at this late hour. The metal coulter of his plough slices the earth with surgical precision, while the thick wooden share lifts the grassy top layer in neat strips. Not far from the ploughman lies a sword in its scabbard. 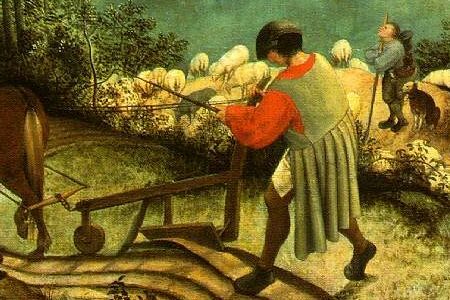 The sixteenth century was a time of (often bloody and disastrous) peasant uprisings: perhaps the painting signifies here that the humble ploughman knows that his place is in the fields, and the sword is best left sheathed; or perhaps to the contrary that the ploughman likes to keep his sword close by, and reserves the option to unsheathe it again. 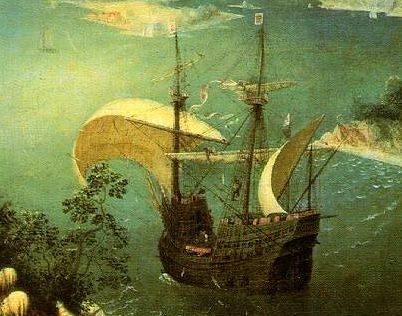 a galleon packed with goods sailing in the direction of the harbour we encountered in the top left corner of the painting. Does the purse next to the ploughman's sword denote the profits from the sale of agricultural goods? Everything in the painting thus far has conveyed a sense of quiet, languid industry, within an environment seemingly designed so that primary goods can be extracted from it and then traded for honest gain. And we may be content with that interpretation, and move on, for at some point after all one must stop reading. 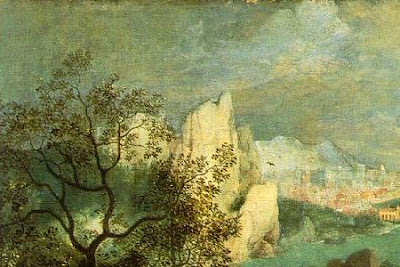 Had we seen the whole picture, and had we known its title – Landscape with the Fall of Icarus – we would have searched for the mythical character, and we would have found him in short order in the bottom right corner of the canvas, where our eyes accustomed to the Latin script are trained to travel and come to a stop. And around that detail, small but significant – all the more significant in fact because it is so small – we would have constructed an entirely different reading, the classical reading from Ovid: that of an act of hubris that fails to transform humanity. While Icarus plunges headfirst into the sea, his legs thrashing about pathetically, the life of earth-bound humans goes on, as does their work. To see whole pictures, and in their proper context, is what book culture prepares us for. To have these images fit our textual environment, instead of having to uncover them bit by bit, pixel by pixel. At times a computer screen is a mask that hides more than it reveals precisely because of what falls outside of its margins, and you may be persuaded of this in spite of the specious, ad hoc nature of my example. But I still wouldn’t call this shallow. 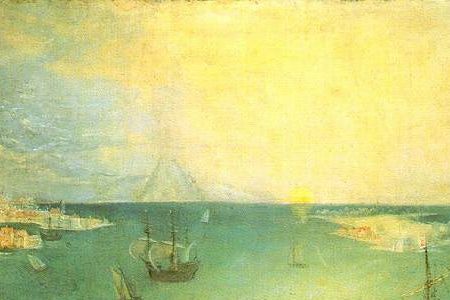 Conversely, to approach the painting with advance knowledge of its title will produce a correct reading every time, one that you will find echoed and validated in the poetic reinterpretations of W.H. Auden’s and William Carlos Williams’. It is a perfectly satisfactory outcome. But I still wouldn’t call it deep. The problem with this particular painting’s title is in fact precisely that it predetermines its meaning, and packages it so neatly that we can just stop there, content with the, yes, superficial explanation. But we should in fact regard this with suspicion: what are the chances that a renaissance artwork could in fact be so transparent to us? Suppose that we had really encountered the image at too high a resolution, and had had to make sense of it little by little, in the manner that I have just described. We might have noticed along the way a lighter patch in the bush above the horse. Suppose we had magnified it. Do you see it? It's a human head: there is a corpse hiding in the undergrowth. And no, I'm not making this up – although Wikipedia's reasonably detailed entry on the painting makes no mention of it. It is in fact covered by several commentators, albeit mostly in passing. The most popular explanation is still Gustav Glück's, according to whom the detail originates in the German proverb 'Es bleibt keiin Pflug stehen um eines Menschen willen, der stirbt' (No plough comes to a standstill because a man dies). I defer to such learned authority, of course, but wouldn't the proverb be covered quite nicely by poor Icarus yonder? Couldn't it be rather that the detail was mischievously inserted by the artist to destabilise the straightforward interpretation of a painting that is itself about misdirection in the way it refuses to foreground its overt subject? Surely not. I won't even point out the irony here – that Glück concurred at the time of his analysis (1936) with the prevailing view that the painting was by Pieter Bruegel the Elder, a hypothesis that has since been disproven. But I'm sure he was right about the other thing. Just like the eminent van Leppen was right when he explained the sword and the purse by means of another proverb, 'sword and money require careful hands' (meaning the hands of the ploughman). This is the same van Leppen who put forward the alchemical reading of the painting, which I shall briefly summarise here: the sun low on the horizon – instead of being high in the sky like the circumstances of the myth would suggest – symbolises the dawning of the philosopher's stone and perhaps alludes to the figure of the labyrinth (don't ask me how); the sea represents mercury, so treacherous for the inexperienced alchemist; the galleon is the crucible; the fall of Icarus is analogous to the precipitation of a substance; the ploughman is the farmer (for alchemists sometimes likened themselves to farmers); and the shepherd is the god Hermes, who tended sheep as a youngster. Thus the painting as a whole would be a visual compendium of the art of alchemy. Now if any of the above sounds far fetched to you, may I suggest it’s because, like me, you’re not a renaissance art scholar? And that it may in fact be quite common in the study of paintings of this era to have a relatively straightforward interpretation overlaid onto others that are far more removed from contemporary sensibilities and modes of knowledge? Which is not to say that van Leppen is bound to be correct, either, nor that anything goes; but rather that it is appropriate for experts and lay people alike to approach these dense artworks and many other texts and artefacts –ancient and modern – at a high resolution, applying layers of interpretation on top of one another and discarding the ones that no longer seem convincing once the evidence is tallied; and furthermore, that it is a process that aims to go deep, as opposed to being satisfied with superficially plausible explanations, and that engages high level critical faculties and interpretive skills, along with new, or newly recovered, forms of literacy. I am not putting this forward to defend the Net against its critics, but rather to call into question one specific critical frame. I contend that it’s not an issue of depth vs. shallowness, but not that there are no issues – and one could point to the proliferation of conspiracy theories on the Net as the flip side of where an over-developed attention to detail can lead us. On this too, I’m afraid, I’ll have a lot more to say in due course. On the complexities of reading this painting and their broader implications, see Patrick Hunt's excellent 'Ekphrasis or Not? Ovid (Met. 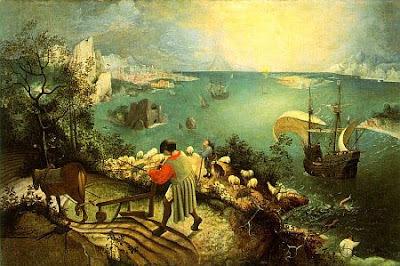 8.183-235 ) in Pieter Bruegel the Elder’s Landscape with the Fall of Icarus'. Piero Bianconi (ed.). L'opera completa di Bruegel. Milano: Rizzoli, 1967. 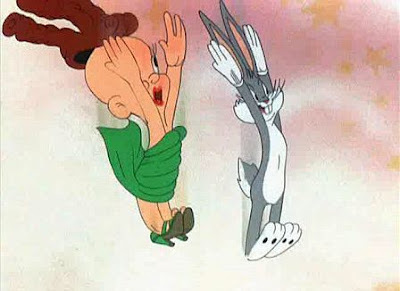 6 minutes and 2 seconds into The Big Snooze (1946), Bugs Bunny and a cross-dressing Elmer Fudd walk off the edge of the dream they’re sharing and begin to fall. Such an exquisitely unnerving spectacle. 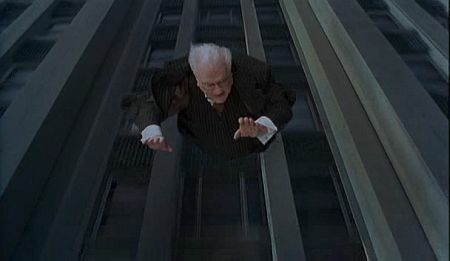 I believe it was Warner Brothers, rather than Disney, that perfected it: the extended free fall – a full forty-two seconds, in this case – towards what one might call an uncertain death. For you knew that there would be a gag in it, but not always safety. 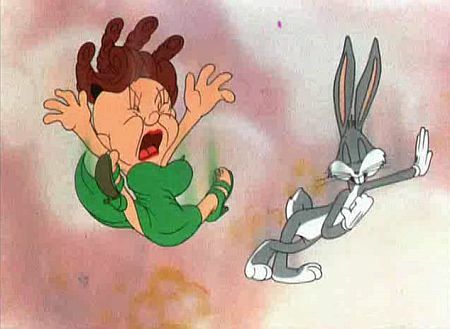 In Devil’s Feud Cake (1962), Yosemite Sam is actually killed when he hits the ground, whilst often at the end of a Road Runner cartoon it’s hard to be sure if Wile E. Coyote is going to be okay. A favourite example comes from Gee Whiz-z-z-z-z-z-z (1956), where the coyote successfully pleads for the spectacle to end before he reaches the bottom of the cliff. 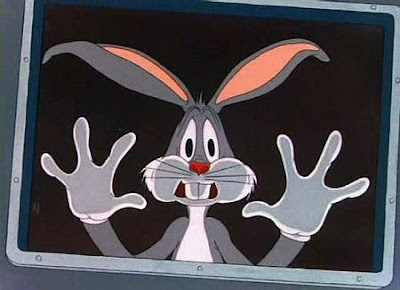 In the end the plane runs out of gas, screeching to a halt inches from the ground, and Bugs is back to his wisecracking self before 'That's All, Folks!' has had time to flash across the screen, but the swift, silly resolution doesn't completely dissipate the tension, nor make you forget the time you were given to contemplate the end of life. 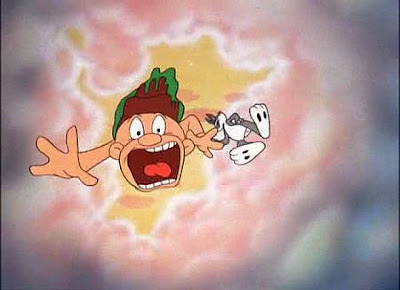 I know this defies the law of gravity, but, you see, I never studied law. Lloyd, Keaton and Chaplin were cartoon characters avant la lettre, only marginally less elastic and ultimately more destructible. They could take a lot of physical punishment but you just couldn’t push them off a plane or a building for there would be no way to save them. In 1988, Robert Zemeckis mixed it up by making Bob Hoskins fall off a cartoon building, in a long sequence – over one minute – of explicit homage to those Warner Brothers wartime cartoons. 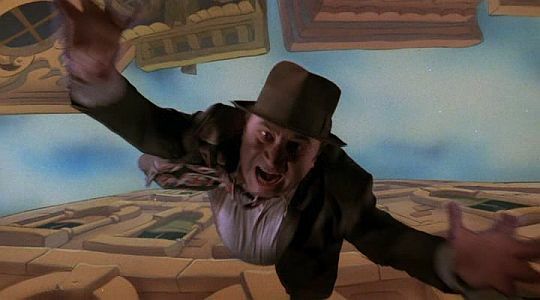 And Joel and Ethan Coen were obviously thinking of both those precedents, and Harold Lloyd’s to boot, in the two falling scenes in The Hudsucker Proxy (1994). The first one, lasting forty-four seconds, follows Hudsucker Industries CEO’s Waring Hudsucker suicide jump in front of his board of directors; whilst in the second one, that lasts several minutes in between other sequences, new CEO Norville Barnes slips off a ledge off the same building only to be saved by the janitor, who jams a broomstick between the cogs of the giant tower clock thereby stopping time. Formally speaking, the Coens’ film was a filmed cartoon, and a mannered one at that. 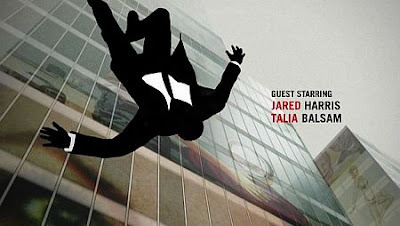 In 2007 the makers of Mad Men reverted to the actual form to stylishly metaphorise on the fall and fall of Don Draper. 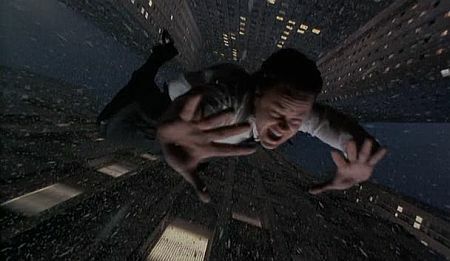 But what these recent examples have in common is that the drama has been drained out; the calculation behind the spectacle is far too evident, like the ropes that support the abseiling artist in Don DeLillo’s Falling Man as he re-enacts that most iconic still image of a man falling off the North Tower of the World Trade Centre. 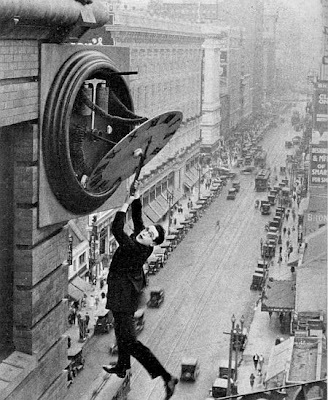 Yet in the age of slapstick they took falling altogether more seriously. 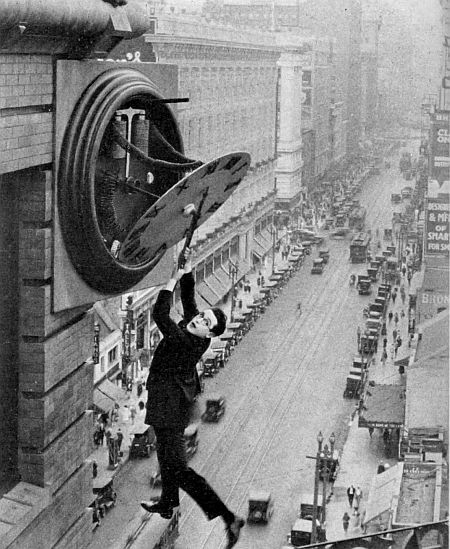 Harold Lloyd, by doing his own death-defying stunts, and by representing the Roaring Twenties as a decade spent on a ledge; Robert Clampett and his fellow artists at Warner Brothers, by undercutting the march towards victory of wartime propaganda with their heroes and villains alike dropping interminably, torturously out of the sky. Not just images of falling, but images of the Fall, just as the Soviet troops marched on Majdanek and then Auschwitz, the Allies on Buchenwald. There is a temptation of course to read all of the art of that era as a sinister allegory, at the risk of overstating one’s case, but conversely it’s hard to know what else to make of the deep weirdness of those Warner Brothers’ cartoons, their manic swinging between the silly and the deadly. Seven decades later, we live in different end times. We’re no longer falling headlong, but just as inexorably, and we need to update the imagery to suit. In this respect I find the title of James Meek’s latest novel very suggestive: We Are Now Beginning Our Descent. It will likely be a drawn out affair, with a lot more time for anger and for bargaining. And then perhaps at the end we’ll touch down gently and safely, only to open the cabin doors onto a world we can no longer inhabit. Late capitalist society is engaged in a long-term historical process of destroying job security, while the virtues of work are ironically and even more insistently being glorified. If you can say of an unemployed person that they are between jobs, then you could also say of the North-facing office on the third floor of the commercial property at 50 Manners Street, Wellington, that it is currently between tenants. At times of economic strife, you need upbeat euphemisms. But is the empty space comforted? Is it ever lonely? Does it look forward to becoming again a place of work, or would it rather be left alone, to mind its own lack of business? A vacant commercial space is a site of anxiety, more so than a vacant dwelling. 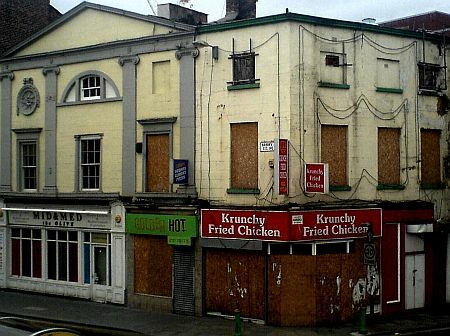 If it happens to include a shop front, its emptiness becomes a concrete representation of crisis. An empty shop on the corner can bring down the whole neighbourhood. We use phrases like that: to bring down, to depress. Things take on mood. Sophie Jerram and Mark Amery have been exploiting this mood for some time in their Letting Space series, in which empty commercial premises are repurposed as temporary art spaces. I wrote some time ago about Dugal McKinnon’s Popular Archaeology, but of more interest to today’s proceedings is the Free Shop set up last May by artist Kim Paton at a former nut store in Ghuznee Street. ‘A social exercise in interrogating the false economics of production in capitalism and in particular the murky terrain of wastage,’ is how David Cross summed it up. I recall asking myself at the time if those premises, which had accommodated a picture framer before becoming a nut store, and before that who knows what else, had ever been as crowded as they were on the day of my visit. But then of course at that point it had really become the opposite of itself, an anti-shop, existing solely by virtue of temporary arrangements with regular shops and their suppliers. And so too The Beneficiary’s Office which has installed itself at 50 Manners Street is the product of careful mediation: with the property owners, with funding bodies, with the welfare provisions that allow Tao Wells to call himself an artist and not charge an admission for it, all on the taxpayers’ dime. Another murky terrain, another interrogation – of the nature of labour, of what are the products of art, and of who should pay for them. [t]he average carbon footprint of the unemployed person is about half of that of those earning over $100,000 […] Surely, an advanced society would see us work less, and enjoy the benefits of unemployed time. We need to work less, so we consume less. The mainstream press became aware that this very timid and relatively uncontroversial critique of our economic system received public funding from Creative New Zealand, and that Wells himself was on a benefit pursuant to the artists-on-the-dole scheme. Lane Nichols of The Dominion Post duly proceeded to prepackage the news so that it could be gnawed at by the predictably outraged. As the righteous indignation spread, Work and Income swiftly responded by suspending Wells’ benefit. Except, contrary to Farrar’s claim, the benefit wasn’t ‘illegally claimed’ at all, and the artist managed to have it reinstated in short order. In a second, less expletive-filled post, Farrar shifted his focus and intimated he would put his influence to good use and lobby for the funding of Creative New Zealand to be cut. And while ACT MP Heather Roy, whose unit of measure of public spending are glue ear operations, managed to sound like the moderate, composed voice of reason, the time came for a new issue of The Listener – formerly our weekly magazine of ideas, now the bastion of the sagging, propertied middle class – to hit the stands. To further bedevil our sense of the balance between free speech and public decency, Wells has accepted public money to create an art installation in which he disparages working people, and exhorts them to ditch their jobs, live off the state and become minimalist consumers. Officials deemed it art for the 37-year-old long-term beneficiary to glorify the notion of slacking and bludging off one’s fellow citizens. The risk for [Creative New Zealand] if it continues to make similar funding choices is that soon taxpayers may not be asking the question of the artworks, but of CNZ itself. So this is it: a $3,500 grant ($2,000 to Wells, plus expenses), and the ongoing support of a scheme that puts artists on the same footing as the regular unemployed, are enough to buy off your freedom to make statements that are minimally provocative. It should be pointed out that Wells never called for a universal living wage, nor for an actual policy of degrowth. Nor did he at any point advocate or postulate the end of work. He simply set up shop, and used the word ‘beneficiary’ to mean something other than ‘welfare recipient who ought to be bloody grateful’. It’s literally all it took. What we have been advocating for, is to do those things that we love, not because we are told that we love them, but because we have found real love there, enough to share. We need to explore the idea, intellectually, of embracing our collective welfare - by taking a break. But then I closed the paper, and my eyes fell on the main headline. 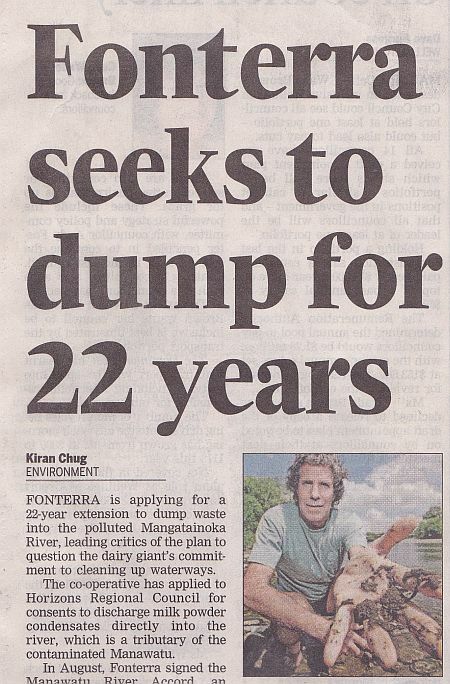 Twenty-two (more) years of dumping, a simple statement that contains all of our dogged determination to run down the clock on the capacity of our environment to sustain us, in the name of the Economy. The value, the force of Wells' work is to be found in these juxtapositions, just like his rhetorical and artistic masterpiece isn't the opinion piece that he wrote himself, but rather the one he had The Listener write for him: a brilliantly succinct formulation of capitalist realism, with its coolly enraged curtailing of the slightest departure from the script that says that growth equals work equals wealth equals equity – a belief as entrenched on the Right as it is on the Left. He’d likely respond that it is the dissenters, the bludgers, who are forcing him to always be working, so that he can support them as well as himself. But two years ago and then again this year his taxes were cut. Is he working any less? I doubt it somehow, and he doesn't appear capable to even entertain the question without exploding into a fit of rage. But somebody should, it is perhaps the single most important question of our time: how to revolutionise society and the very concept of labour, no longer in the name of equity and justice, but the survival of the species. David Aronowitz and Jonathan Cutler wrote this over ten years ago: 'What has been called utopian in the past is now a practical necessity.' To work less, so that we all can work. To discriminate between the work that makes us richer, and the work that makes us poorer. To imagine a post-work society and create the material conditions for its existence. 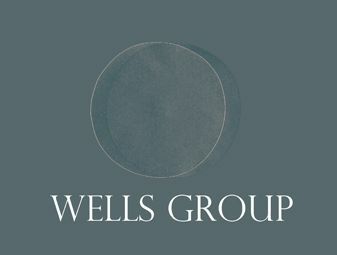 In the meantime, The Wells Group will close its doors this Tuesday; Tao Wells will go back on the dole while he works on his next project; the North-facing office on the third floor of the commercial building at 50 Manners Street will be emptied again; and on Wednesday, all over the country that has chosen a currency trader as its Prime Minister and where questions cannot be asked, thousands of beneficiaries will wake up wishing for work, (almost) any work, as without a doubt in their place would I. The Beneficiary's Office closed on November 2nd. It would be remiss of me not to link to the thoughtful reviews of the exhibition by David Cross at EyeContact and Lew at Kiwipolitico. The Aronowitz and Cutler quotations are from Post Work: The Wages of Cybernation (New York: Routledge, 1998), pages 40 (the epigraph) and 69 (the quotation in the post).